DECEMBER 12, 1988, saw the final ship to be built on the Wear slide down the slipway on a bitterly cold winter’s night. The chill which affected onlookers not only came from the plunging temperature but from the realisation that an industry, which had sustained Sunderland for centuries, had disappeared. Efforts continued to revive it and campaigners put up a spirited fight. Their hopes were raised repeatedly only to be dashed as time and time again progress became enmeshed in red tape stretched tightly between the European Commission in Brussels and Whitehall in London. It is true that the Sunderland shipyards were struggling to find orders before they closed. The world market for ships was a tough one and the Tory Government decided enough was enough and they were not going to help the Wearside industry any longer. The closure deal was put together by the European Commission and the British Government. It involved a £45million aid package to soften the blow for Sunderland and that meant that a ban - or moratorium - on shipbuilding had to be brought in. Euro-chiefs did not want to see millions of pounds of aid pumped into Wearside to compensate for the loss of a major industry, only to see it start up again a few years later. So unclear at times were the terms of the closure that it was not immediately apparent that the ban was to last for ten years. And so Sunderland resigned itself to the loss of the yards. Events moved quickly. At Southwick, which many still called the Austin & Pickersgill yard, a major auction of plant and equipment was held. Then the demolition squads moved in and the world-famous yard was levelled, crushing any vestiges of hope that it would ever turn steel into ships again. It vanished virtually overnight. The same fate awaited the North Sands yard. It was bulldozed and eventually housed a new university campus. That left only the Pallion yard intact, but, unable to build ships, it was effectively mothballed, frozen in time, a reminder of the glory days of shipbuilding. But its name also served as a rallying call for diehard shipyard campaigners who lived in hope that one day, perhaps, the industry would return. Taken over by an Anglo-Greek consortium and called Pallion Engineering, the yard has been maintained. But, as a fully operational shipyard, building ships, Pallion has slumbered. Shipbuilding on the Wear was, to all intents and purposes, forgotten. It is difficult to believe that the River Wear at Sunderland was not bridged until the 1790s. Wearside’s growing wealth was, of course, based upon shipbuilding and the export of coal – and the tall-ships of the day needed lofty access to the river’s lower reaches. Any such bridge would have to arch high above the river, and stone – the commonly-used material of the day for such projects – would surely be too expensive for such an exercise. After all, the river valley was wide (250ft) and fairly deep at this point. But the need was becoming pressing by the end of the eighteenth century and something had to be done. 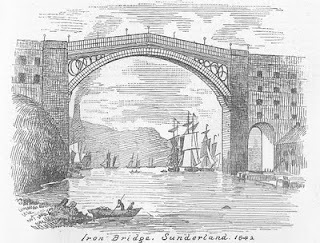 Sunderland’s current Wearmouth Bridge is familiar to us all nowadays, of course; but its predecessor, the extraordinary ‘Iron Bridge’, had an unlikely link with an internationally famous historical hero. Thomas Paine, author of the seminal The Rights of Man, is the chap in question. Paine’s writings would help shape the post-revolutionary development of both France and the United States in the 1780s and 90s, but he had many other interests, too – among them, inventing. And though it has been the cause of much controversy over the years, it seems that it was a design formed originally by Paine in 1787 for a bridge over the Schuylkill River in Pennsylvania which eventually found physical form over the dear old River Wear. The story is complex and unclear, but it is now generally accepted that the original ‘Iron Bridge’ at Sunderland, built during 1793-96, was based, at least loosely, on Paine’s original ‘American’ model. For reasons of finance, it seems, the US scheme never came to fruition, the half-finished, British-built bridge, finding itself being shipped north by its Rotherham constructors to form the basis of Sunderland’s brand-new industrial wonder. Local MPs, Rowland Burdon and Ralph Milbanke, were the driving forces behind the scheme. After much research, both wood and stone were discarded as possible building materials; then, somehow, Paine’s iron-bridge design seems to have risen to the top of the pile. The world’s first-ever such effort, the famous ‘Ironbridge’ at Coalbrookdale, had been completed as recently as 1779 – but this famous gap measured only half of that to be bridged at Sunderland. Nevertheless, Burdon, Milbanke and their team (including, notably, engineer Thomas Wilson) bravely went for it, and gave the Walker Ironworks in Rotherham the go-ahead to start (or, perhaps, continue) the manufacturing process. In the meantime, huge abutments were raised on the north and south banks of the Wear (completed in 1795), then two enormous wooden scaffolds were erected in the river to take the weight of the iron arches during construction. Six iron ribs were swiftly lifted into place to form the skeleton of the bridge, after which a further year was spent on applying the finishing touches. The new erection, at the time justly considered one of the wonders of the world and built at a cost of some £30-40,000, was finally opened on 9th August 1796. It was the largest single-span iron bridge on the planet, and over 80,000 folk turned up to witness the occasion. Linking Bishopwearmouth and Monkwearmouth in this way proved to be the making of Sunderland, which flourished thereafter. It was a magnificence piece of engineering and much lauded in its day; but its design was flawed. As early as 1805, repairs were deemed necessary when the heat of the sun caused the cross-tubes which held the ribs together to loosen. And so the remedial work continued, until, in 1857, the famous Robert Stephenson took it upon himself to oversee extensive restructuring. The bridge was stripped back to its bare ribs, new iron-work added, and the abutments were raised to straighten out the lop-sidedness of the structure and to iron out the bridge’s distinctive hump. The result was a neater, simpler affair and bore the inscription, in Latin, “Do not despair, have faith in God.” It was re-opened in March 1859. The volume of traffic over the fine old structure, however, continued to escalate, until it was decided to replace the bridge completely in the 1920s. But that, as they say, is another story. 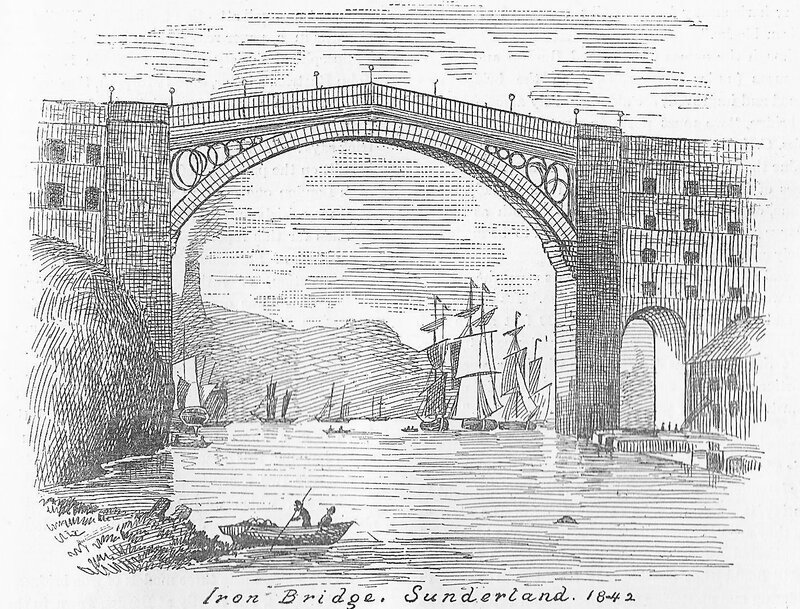 The illustration shows a somewhat stylised engraving of the original Wearmouth Bridge, depicted prior to Robert Stephenson’s alterations. In reality, the bridge was a little lower and more elongated. One of the world’s greatest historical treasures, the Codex Amiatinus is the oldest surviving one-volume Latin Bible in the world. One of three Anglo-Saxon Bibles produced by the twin monastery of Wearmouth-Jarrow, it is the only survivor, and dates from the early 8th century. It is likely that the Venerable Bede himself was involved in its compilation. Now in the Laurentian Library in Florence, it is considered one of the globe’s greatest artistic artefacts. 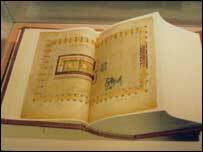 It is a huge tome, with over 2060 vellum pages, made from 515 animal hides and weighing in at an incredible 75lb. Written by several scribes, the original three-Bible project was a mammoth task – most other monasteries were, at the time, reproducing just the four Gospels or the Book of Psalms. The surviving copy was intended as a gift for Pope Gregory II from the then head of the Wearmouth-Jarrow monastery, Bishop Ceolfrith. However, on his way to Rome to deliver the goods, Ceolfrith died in France in AD716 – though his followers completed the task in his honour. Much of the book’s history thereafter is unknown, though it eventually surfaced at a monastery at Monte Amiata in Italy. Highly prized, it was for many years thought to be a 6th century Italian work; its true origins only being discovered after close scrutiny following its move to Florence after the monastery closed. By this time it had been given the name ‘Amiatinus’ after the religious house where it had spent so much of its time. The Codex Amiatinus is perhaps the North-East’s greatest ever creation, and something of which we should all be very proud. But was it produced in Wearmouth or Jarrow, or both? Truth is, I don’t think anyone will ever really know for sure. Oh dear, another Tyneside/Wearside dispute. See here for a much fuller (and very entertaining) history of the manuscript. The early churches founded in the North were chiefly built of timber, ‘after the manner of the Scots’; but Biscop built his churches of stone, ‘after the manner of the Romans.’ And it is interesting to find that the same great founder of churches also brought makers of glass from France, who not only, as Bede tells us, glazed the windows of Benedict’s churches, but taught their art, which till that time had been unknown in Britain, to the natives. 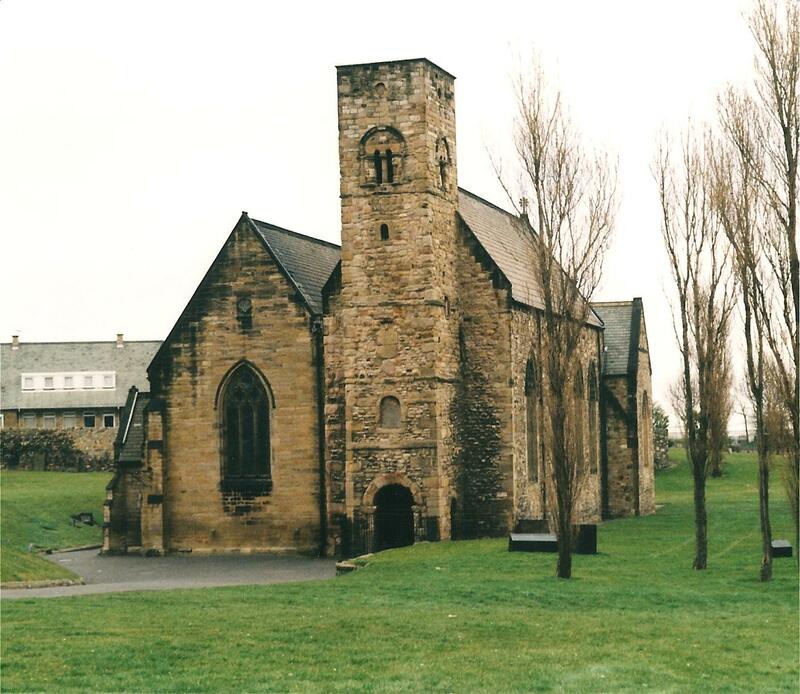 The sight of a structure which has withstood the storms and changes of more than twelve centuries is always impressive; but especially is this the case when, as at Monkwearmouth, that structure is linked with an event of absorbing interest in the early history of our country. Biscop and Bede were great men. The former was a great builder, a man of large and liberal views, and a generous patron of literature and the arts. The latter was the great scholar of his age. Jarrow and Wearmouth were the principal seats of learning, not in the North alone, not in Britain alone, but in the whole of Western Europe. The perishing sculptures which adorn the sides of the entrance of this ancient tower may seem rude to us, but no one can fail to see in the baluster shafts which are built into the same doorway, and which also occur in the little windows high up in the west wall of the nave, evidence of genuine and refined art. And it must not be forgotten that the famous Codex Amiatinus, the most valuable MS now in existence of the ancient Latin version of the Bible, with its beautiful calligraphy and its gorgeous illuminations, was certainly written either at Jarrow or at Monkwearmouth. We have only space to add that the lower portion of the tower is of much earlier date than the upper part. This lower part was originally not a tower, but a porch, the ‘porticus ingressus’ as it is called by Bede. The gable line of its original roof may be seen rising to a point between the second and third string courses. 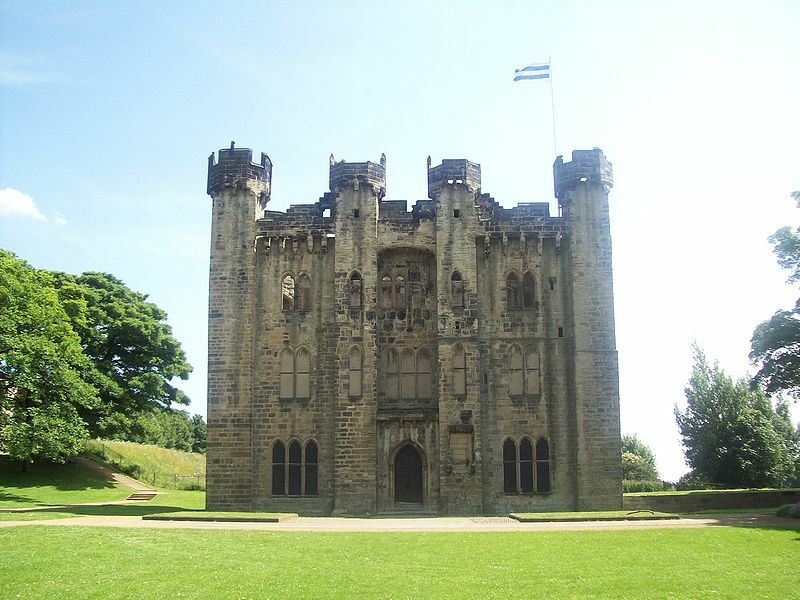 This curiously-situated relic of the past has withstood the ravages of time, the elements and local redevelopment since its original construction around 1400 by one Sir William Hylton, whose family had estates spread across the northern counties. It is not known if there were any previous buildings on the site, though there is some speculation that a wooden structure may have stood thereabouts as early as the late eleventh century when William I granted the land to the family. Today only the impressive gatehouse tower remains, though other buildings at one time existed to the east, probably arranged around a courtyard. The now ruinous west-facing frontage of the former castle was four stories high (but is now, more-or-less, three), though it still has its four turrets. Carved figures once stood on the battlements, and distinctive heraldic carvings can be made out across the still impressive façade, featuring the arms of the king, the Hyltons and related families. Interestingly, on the eastern face can be seen the ‘stars and stripes’ of the Washington family. The ruin bears the marks of numerous additions and alterations, including nineteenth century Gothic windows, and scars which give away the former presence of wings added and destroyed over the centuries. Internally, the Great Hall would have been on the first-floor, with private chambers, for the most part, taking up the higher levels. What remains of St.Catherine’s Chapel, founded in the mid-twelfth century, lies nearby. The Hylton family retained their rank and status until the mid-sixteenth century and the Civil War; but afterwards remained wealthy enough to both retain and develop the castle until the last of their line died in 1746. It passed through several hands in the ensuing two centuries, during which time many of the more obvious alterations evident today were carried out – though much had to be demolished during the twentieth century due to general decay and vandalism. The state took the structure over in 1950, and it is now looked after by English Heritage. The surrounding parkland is neatly maintained by the local community. The castle was said to be haunted by the Cauld Lad of Hylton until he was appeased with the gift of a cloak and hood. 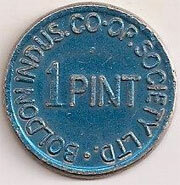 This is something many of you will remember: a 1 pint milk token issued by the Co-operative store – in this case, the one at Boldon. These were purchased by customers in-store from about WWI onwards, and used to pay your milkman when he was on his rounds. They would be handed to him in exchange for your milk or, usually, left out on your doorstep with the empties. This meant that no cash was exchanged and no change need be given. If the price of a pint went up, the colour or shape was changed – and if you were stuck with some old tokens, you simply made up the difference in small change. The advantage of buying the pre-payment tokens at the Co-op was that your purchase would go towards your ‘dividend account’ (a sort of early loyalty bonus). Other tokens could be bought for other food items such as bread, and even for coal. Early tokens were made from iron, brass, copper, bronze or aluminium, and later ones from plastic. The tokens fell out of use in most areas many years ago, of course; though at least a few were still in circulation as late as 2006! As many people know, the famous Domesday Book of 1086 does not cover English lands north of the River Tees. For whatever reason – be it that the area had been ‘wasted’ by the Normans in previous years, or, more likely, that the region was considered ungovernable – the surveyors studiously avoided the present-day counties of Northumberland and Durham when the most famous manuscript in English history was compiled 900+ years ago. King William I was happy to let the infamous Prince Bishops of Durham get on with it up here, it seems. And they were pretty powerful men in their day. Perhaps the most famous of them, Hugh de Pudsey, considered himself so important, in fact, that he commissioned a ‘Domesday Book’ of his own in 1183 – a work that came to be known as ‘The Boldon Book’. Though it differs in both its function and scope from Domesday, it still provides an important snapshot of the region in the late twelfth century. Basically, it presents an assessment of the land’s worth, its annual returns and its customary tenures – and paints a picture of a settled system of Anglo-Saxon feudalism going back generations. Unlike its big brother, it presents a more colourful image of everyday life, with several amusing and seemingly mundane observations. 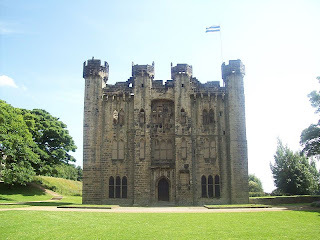 The Boldon Book does not cover all of Northumberland and Durham, but includes almost all of the latter, and large tracts of land of the former which were then the property of the Bishop of Durham (some areas on the southern bank of the Tweed and the area around Bedlington). The name ‘Boldon’ comes from the text’s tendency to refer back to the Boldon entry (one of the first in the manuscript) when a settlement’s tenurial set-up was similar to the aforementioned village (viz. ‘as of Boldon’). The book lists each settlement in turn, giving an account of tenants’ obligations – both individually and collectively. The original text has long since been lost, but four copies survive – including one in Durham’s Chapter Library. Transcriptions and interpretations have appeared in the Surtees Society publications (vol.25), the Victorian County History, and one or two other places; but the most accessible by far is that published by Phillimore & Co. Ltd in 1982 – which can still be found in libraries and, occasionally, in second-hand bookshops or online. 2nd April – At a wedding which took place at Whitburn Parish Church, a curious and very ancient custom was observed. What were described as ‘hot pots’ were brought by several of the residents of the village, and, as the party were leaving the church, the bride and bridegroom were invited to taste the liquid contained in them. The mixture consisted of various ingredients, and looked and tasted something like brewers’ yeast. The villagers claimed that the custom prevailed only in Whitburn, and that it was so ancient that the origin of it could not be traced.